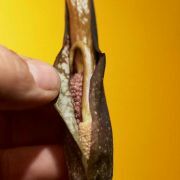 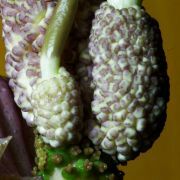 From time to time we get sent pictures of odd aroid infloresences and so on. 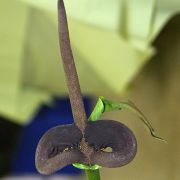 Well - they're all odd, but some are odder than others. 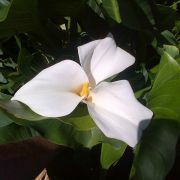 Anyway, here they are. 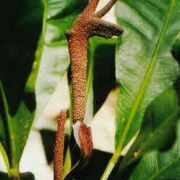 If you have a photo of an odd aroid growth, and would like to contribute to this page, please let Albert Huntington know. 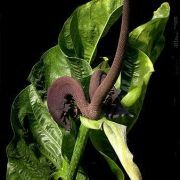 Maurice Needham sent this photo of a double spathed Arum palaestinum from New Zealand. 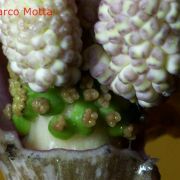 Marco Motta sends this Amorphophallus elatus with three spadices. 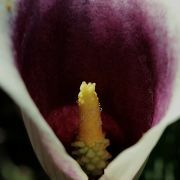 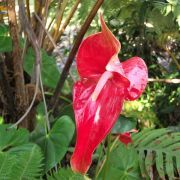 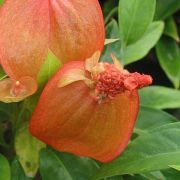 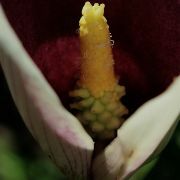 Enid Offolter found this misshapen inflorescence of Anthurium 'Marie' ©2012 by Enid Offolter. 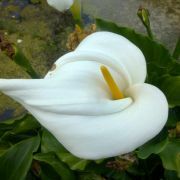 Maurice Needham sends a double spadiced Zantedeschia aethiopica from New Zeland. 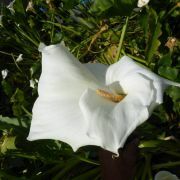 Maurice Needham sends another Zantedeschia aethiopica oddity from New Zeland. 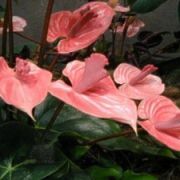 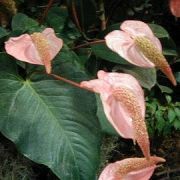 Ian Edwards sends the triple-spadixed Anthurium entitled "Santa Fe Rock". 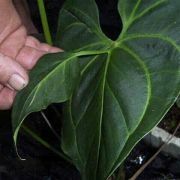 Enid Offolter sends these Philodendron leaves from a batch of Brazilian seed. 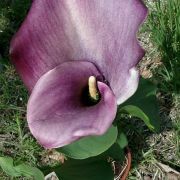 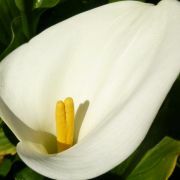 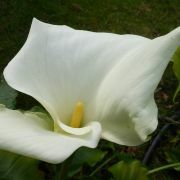 Alletta Oosthuizen sends this photo of a Zantedeschia aethiopica with three spathes. 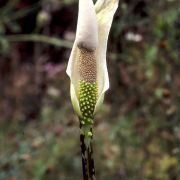 Amorphophallus beccarii with some female flowers on the peduncle and with an open spathe. 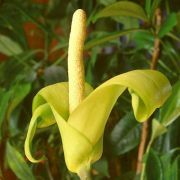 Anchomanes dalzielii with two spathes.Margret Kiehlmann writes "The 2 plants are in my collection and showed these abnormal inflorescences only one time. 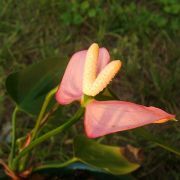 The other inflorescences were normal." 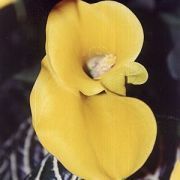 Anthurium Twingo has two spathes. 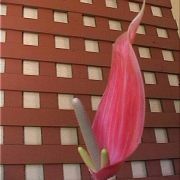 Katrina Smith says the triple spadix photo was taken in 2000 at the Balboa Park Lath House. 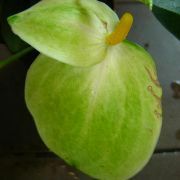 Here's a green Anthurium scherzerianum cultivar with two large spathes. 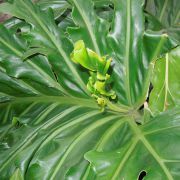 The mutant scherzerianums grown at Exotica Plants from seedlings provided by Cape Oasis. 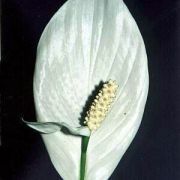 This just can't be right... From the IAS show in 2004. 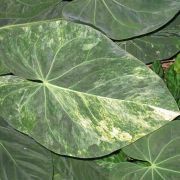 This variegated dark leaf plant is very stable, even seedlings have same markings. 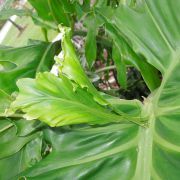 Plants pictured are growing at Flecker Bot. 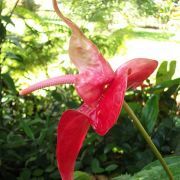 Gdns.in Cairns. 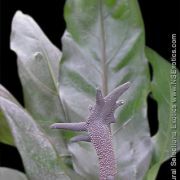 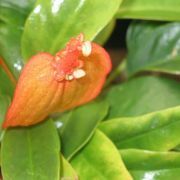 A brand new cultivar of Anthurium, unidentified, very small less than 30 cm tall. 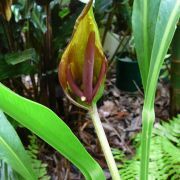 The inflorescences have a very small spadix or even a lack of it. 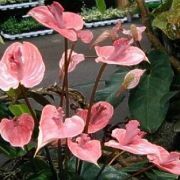 Another double spadiced Anthurium andreanum cultivar. 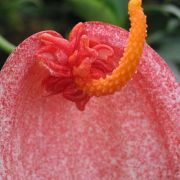 Another double spadiced Anthurium andreanum cultivar ( alternate view ). 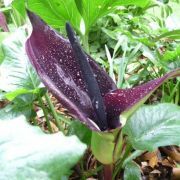 Zantedeschia 'Black Eyed Beauty' - I saw in a shop - only one inflorescence of 5 had a double spathe. 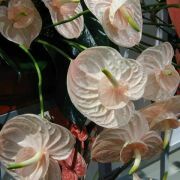 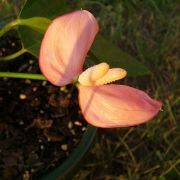 Donna Maemori sends us these photos of a double spathed Anthurium andreanum cultivar. 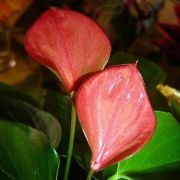 Donna Maemori sends us these photos of a double spathed Anthurium andreanum cultivar ( alternate view ). 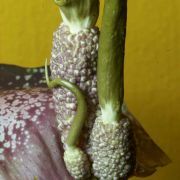 Percy Simonsenm, who has done many hybrids within the crystalinum - forgettii group, spotted these double spathe and weird leaf mutants a few years ago. 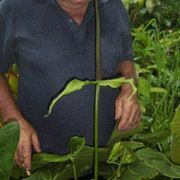 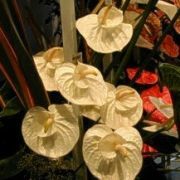 The purpureospathum plant was imported from MoBoT many years ago by Peter Sargent and has grown these sort of mutant spadix a few times. 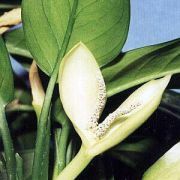 Aglaonema treubii - only one inflorescence occured like this in its lifetime, the rest were normal). 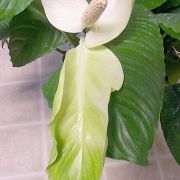 A Spathiphyllum cultivar, sometimes it blooms like this.